In the sunny afternoon of 30th August 2017 Akhil Bharatiya Vidyarthi (ABVP) organised a ‘Chattra Adhikar Rally’ at the north campus of Delhi University. The rally which was organised in the wake of the upcoming elections, ABVP pushed forward its demands for U-Special Buses, more hostels and supplementary exams from the administration. The rally which was scheduled to begin at afternoon beginning at 1 PM. The rally started with the speeches by several supporters and activists. The crowd which was sparse at the beginning started growing in its size within an hour as individual candidates arrived with their supporters in large numbers. This was followed by speeches by the prime candidates who aspire to fight DUSU elections on an ABVP ticket. Amidst shouting of support slogans of candidates, some of them spoke about their plans for the upcoming year, if they win the elections. The major plank on which ABVP is going to fight the elections this year is hostels, U-Special buses and supplementary exams. While speaking at the rally some leaders took the credit of drawback of FYUP as well as printing of statement of marks. 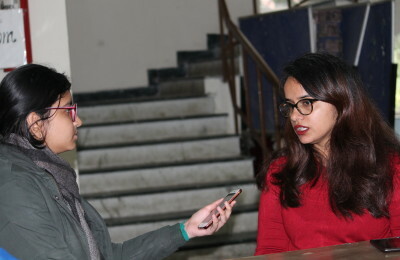 Some of the candidates also highlighted that keeping anti-national forces out of the University would be their prime focus. A brief spell of rains in the middle of the event forced the supporters to seek shelter under roofs available nearby. As the rains paused, the rally begun from the arts faculty and proceeded through the Ramjas College and then passed through the arts faculty through the road in front of SRCC. The rally ended with slogans of ‘Bharat Mata ki Jai’ and ‘Vande Mataram’. Image credits: Srivedant Kar for DU Beat. Previous PostQuora, Entrepreneurship, And Technology with Balaji Viswanathan at Cluster Innovation Centre Next PostHow important is party, caste and gender in DUSU elections?